A quick stop at the Petsmart tiny doggie isle brought us to the most appropriate kitty shirt ever! Peanut now has a little Old Navy hoodie and the signature Hieu-household black t-shirt. (Everyone in this house has a black t-shirt) He's not quite as dressed up as say... my friends's pets, but he's starting to build up a wardobe. 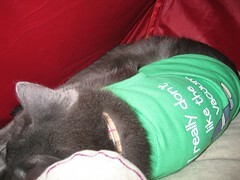 So here's Peanut in his new "I really don't like the vacuum" T, sleeping on his Ikea mouse in his Ikea tent.